If you are looking for a new challenge, want to support a great cause or just want a day out with family and friends, then here’s a date for your diary. 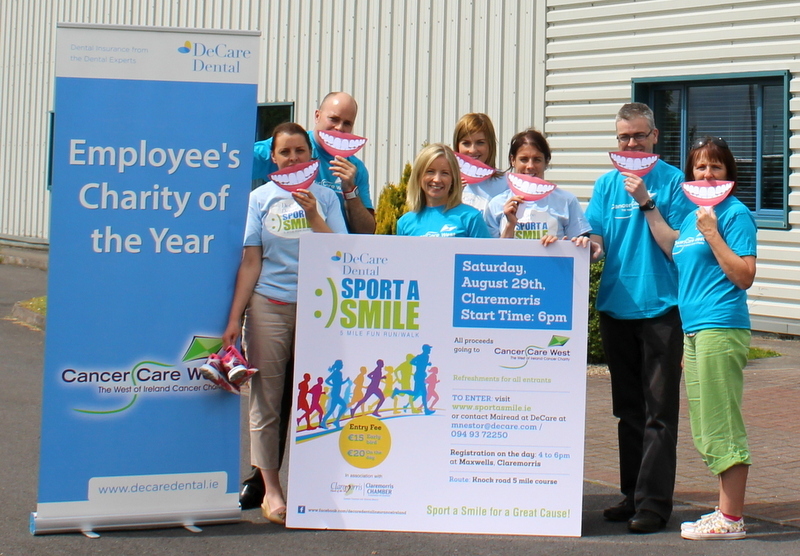 DeCare Dental’s annual Sport a Smile 5 mile fun run/walk takes place this year on Saturday 29th August at 6pm. Kicking off in Claremorris, the race has become a West of Ireland diary staple as it now enters its 14th year. So, it’s fitting that all proceeds this year will go to Cancer Care West, a charity that is renowned for its great work in the West. Over the last 14 years the event has raised over €125,000 for charity, thanks to the support of the participants, local businesses and supporters. David O Donnell (left) from Cancer Care West pictured with members of the DeCare Dental Team at the launch of the DeCare Dental Sport a Smile 5mile run/ walk. At 5 miles, the race is a good challenge for runners and walkers alike and is also the 5th race of the Mayo AC Move2Improve series this year. The race starts at 6pm on Saturday 29th August from the square in Claremorris, with refreshments afterwards for all participants. 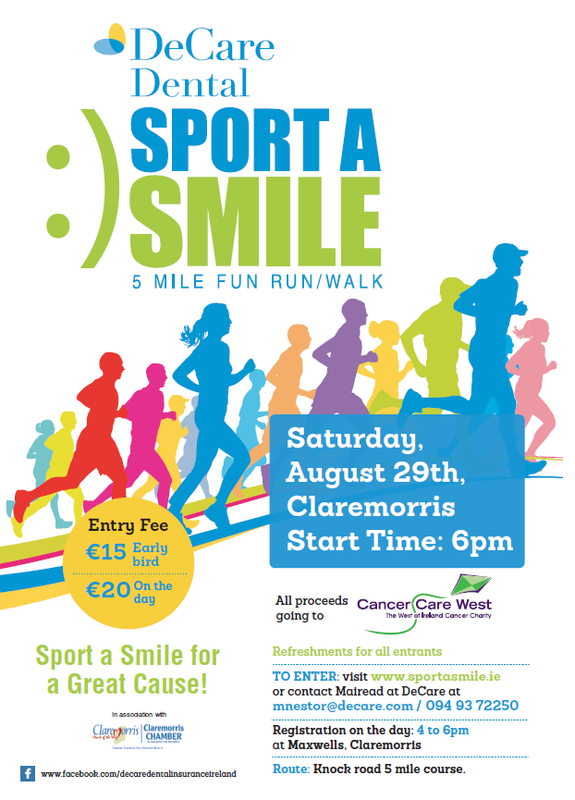 For those who wish to enter the Sport a Smile run/walk, online registration can be found at www.sportasmile.ie. There is an early bird entry fee of €15 per person or €20 registration on the day with all proceeds going directly to Cancer Care West. Registration and race pack collection is available on race day at Maxwells, Market Square, Claremorris from 4 to 6 pm. It is advised to arrive in good time to collect your number before the race.